ᐅᑯᐊ ᑎᑎᕋᐅᔭᖅᑕᐅᓯᒪᔪᑦ ᒪᒃᑯᒃᑐᓄᑦ ᑭᓐᖓᕐᒥᐅᓄᑦ ᓴᓇᔭᐅᓚᐅᖅᓯᒪᔪᑦ ᐃᓱᒪᐅᑉ ᓴᓇᐅᒐᖏᓐᓂᒃ ᑕᐃᔭᑦ ᐊᕐᕌᒍᑕᒫᖅ ᐃᓕᓐᓂᐊᓯᓐᓈᖅ ᑎᑎᕋᐅᔭᖅᑎᑕᐅᑎᓪᓗᒋᑦ 2016 ᐅᐱᕐᖔᖓᓂ. 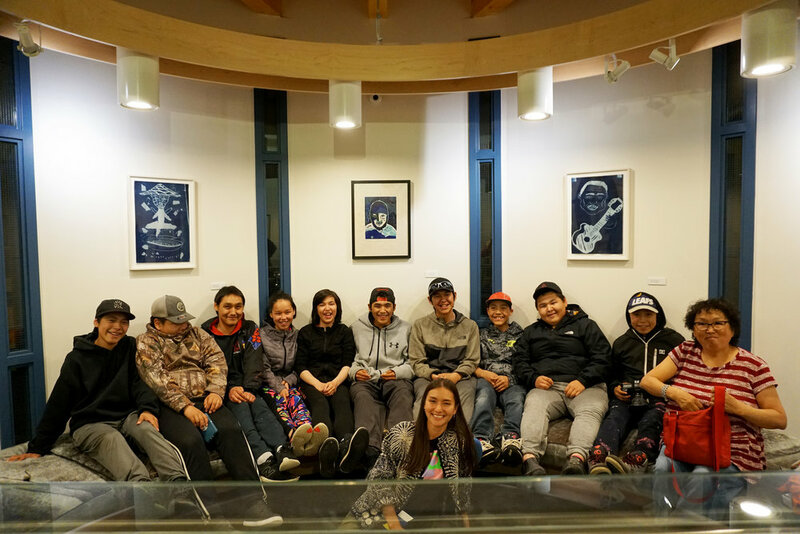 ᒪᒃᑯᒃᑐᑦ ᑎᑎᕋᐅᔭᕐᕕᖕᒥ ᑲᑎᓐᖓᓪᓗᑎᒃ ᐱᓕᕆᖃᑦᑕᓚᐅᖅᑐᑦ ᐱᓇᓱᐊᕈᓯᕐᓄᑦ ᐊᒥᓱᒐᓚᖕᓄᑦ, ᐊᒻᒪ ᐊᖏᔪᐊᓗᖕᒥᒃ ᑎᑎᕋᐅᔭᓚᐅᕆᓪᓗᑎᒃ ᐱᓐᖑᐊᕐᕕᐅᑉ ᖁᓕᓕᒫᖓ ᓈᓪᓗᒍ, ᐊᕐᕌᒍᑕᒫᖅ ᑎᑎᕋᐅᔭᒐᕐᒥᓂᒃ ᑕᑯᒃᓴᐅᑎᑦᑎᑎᓪᓗᒋᑦ. 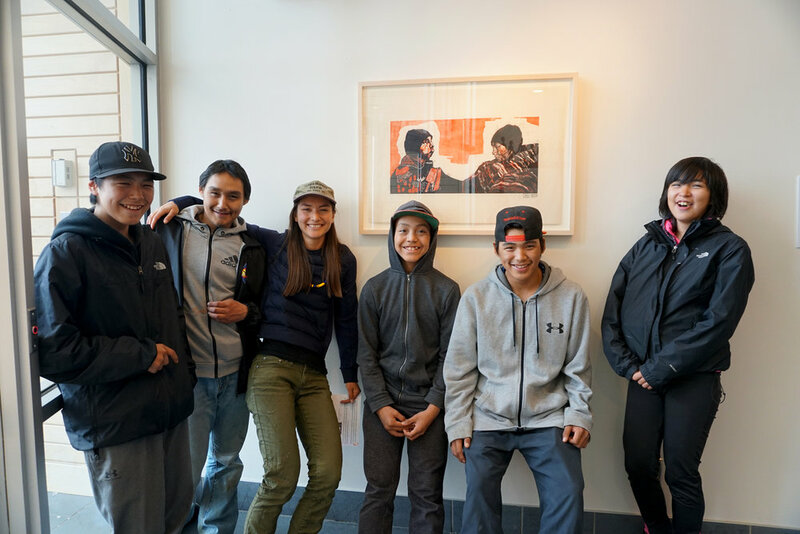 This body of work was created by youth in Kinngait during Embassy of Imagination's annual workshops in Spring of 2016. 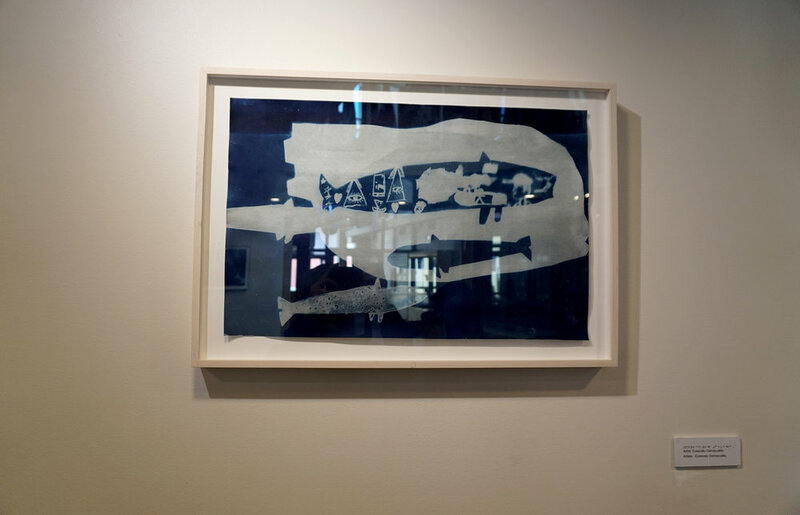 The work explores different approaches to printmaking that expands the scope of the printmaking processes for which Kinngait is known. 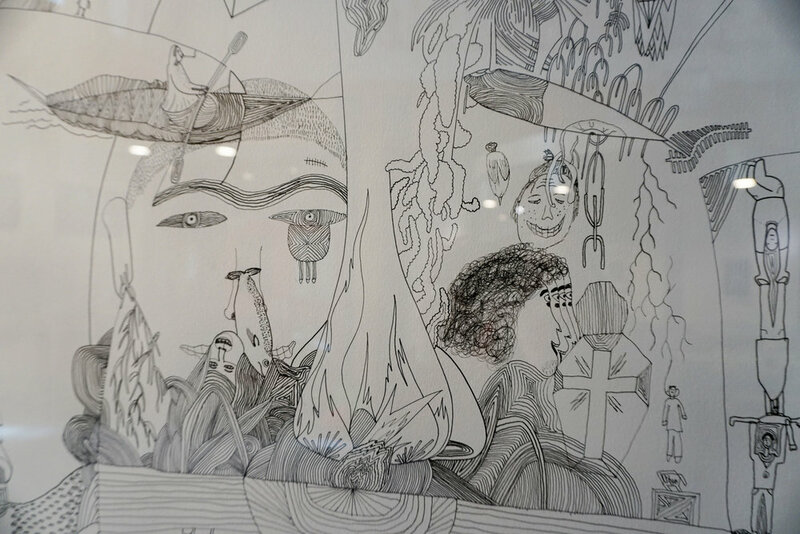 The youth worked in a studio environment together over several weeks, also creating together a mural on the entire ceiling of their Community Hall where they hosted the annual Embassy of Imagination exhibition. ᐅᓇ ᑎᑎᕋᐅᔭᖅᑕᐅᓚᐅᖅᑐᖅ ᒪᒃᑯᒃᑐᓄᑦ ᐊᕐᕌᒍᓕᖕᓄᑦ 14 ᐊᒻᒪ 18 ᐊᑯᓐᓂᖏᓐᓃᑦᑐᓄᑦ, ᐹ ᔫᓯᐱᐅᑉ ᐊᑖᑕᑦᑎᐊᖓ ᐊᒡᔭᖅᓯᓐᖑᐊᖅᖢᓂ ᓯᖁᒥᓯᒪᔪᒥᒃ ᖃᒧᑕᐅᔭᕐᒥᒃ ᐅᑎᐅᑎᕙᓪᓕᐊᔭᒥᓂᒃ. ᐅᓇ ᐊᑐᓪᓚᕆᓚᐅᖅᑐᒥᒃ ᐅᓂᒃᑲᐅᓯᓕᒃ, ᑕᕝᕙᓂᑦᓴᐃᓐᓇᕐᓗ ᐊᒥᓱᓂᒃ ᓂᕐᔪᑎᓐᖑᐊᓂᒃ ᓂᕿᒋᔭᐅᕙᒃᑐᓂᒃ ᑎᑎᕋᐅᔭᓚᐅᖅᖢᑎᒃ ᐃᓕᓐᓂᐊᖃᑎᒋᔭᖏᑦ. 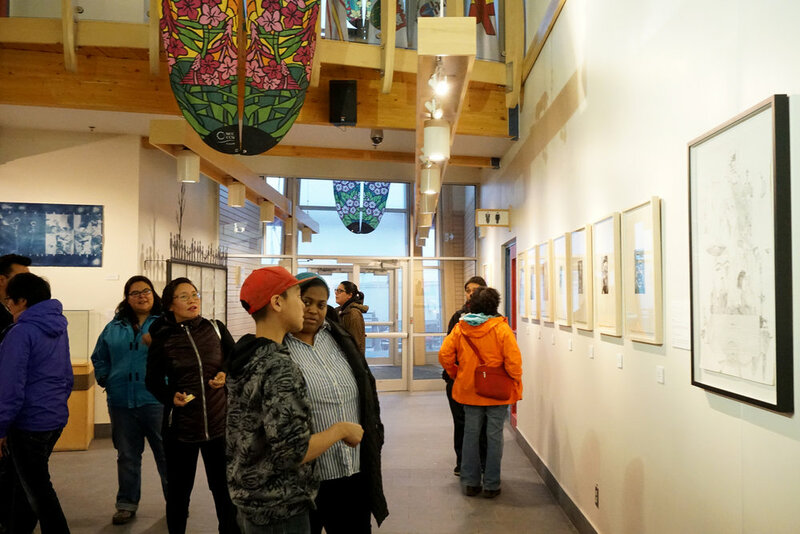 ᐹᓕ ᐃᓱᒪᔪᖅ ᐃᓄᐃᑦ ᐊᒃᓱᕈᕐᓇᖅᑐᖅᓯᐅᕋᓗᐊᕈᑎᒃ ᓴᓐᖏᔫᖏᓐᓇᕐᓂᐊᖅᑐᑦ. 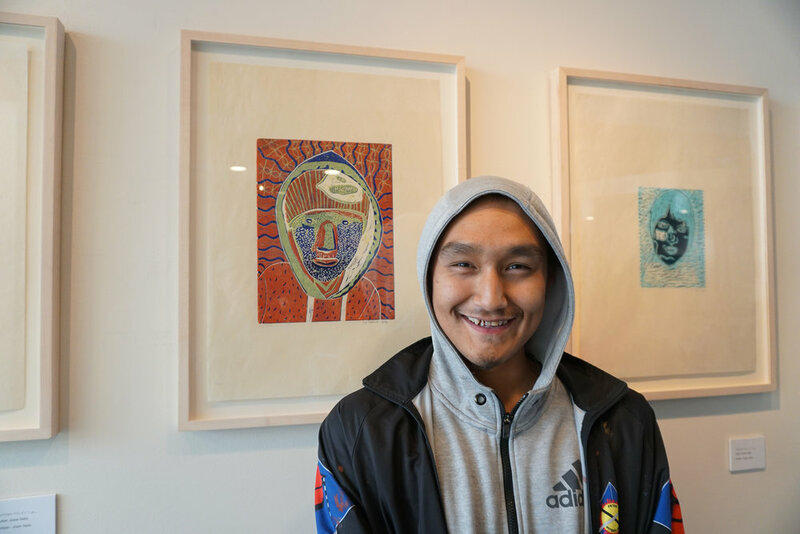 ᑖᓐᓇ ᑎᑎᕋᐅᔭᒐᖅ ᓴᓇᔭᐅᓚᐅᖅᑐᖅ ᐃᑲᔪᖅᑕᐅᓪᓗᑎᒃ ᓄᓇᕗᒻᒥ ᓴᓇᓐᖑᐊᖅᑏᑦ ᑲᑐᔾᔨᖃᑎᒌᖏᓐᓄᑦ ᐊᒻᒪ ᑎᑎᕋᐅᔭᒐᓕᕆᔨᓄᑦ. 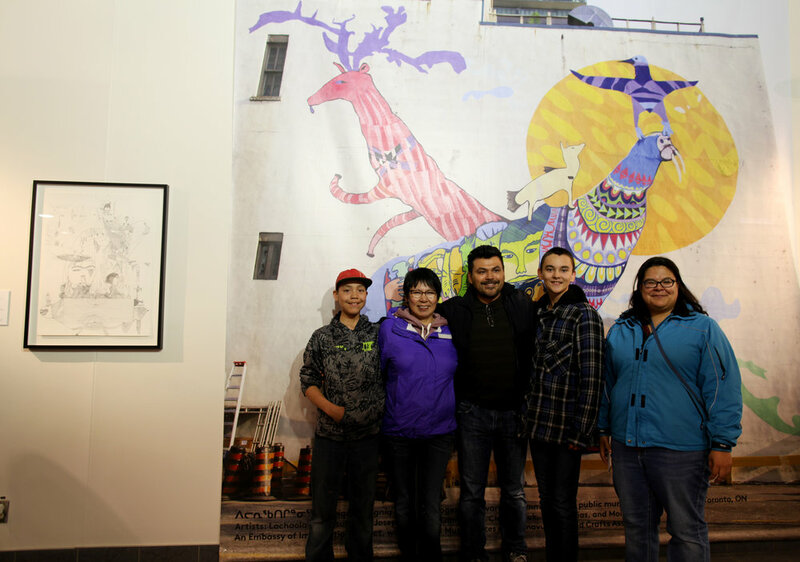 This public mural by youth aged 14-18 features a drawing by Parr Josephee of his grandfather carrying his broken down snowmobile back to the community. 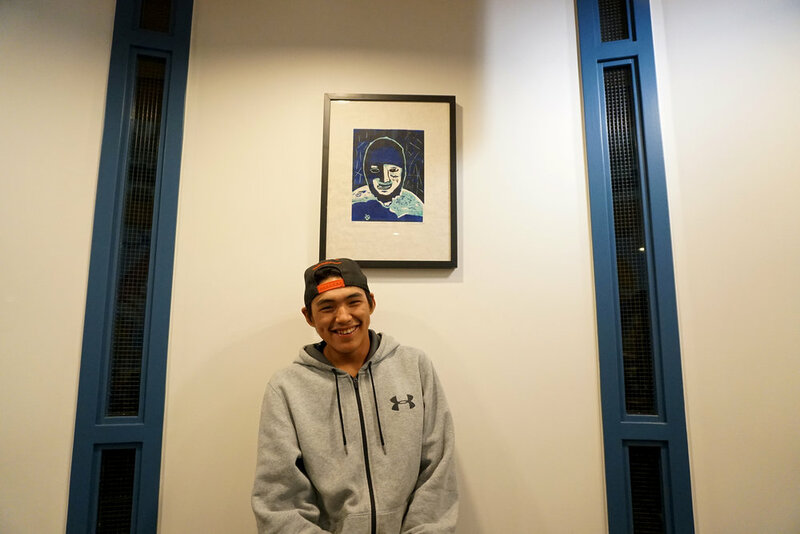 This is a true story, which in combination with the many country food animals drawn by the other youth, for Parr means that Inuit are strong even when things are hard. linoleum blocks. The prints are printed by hand. 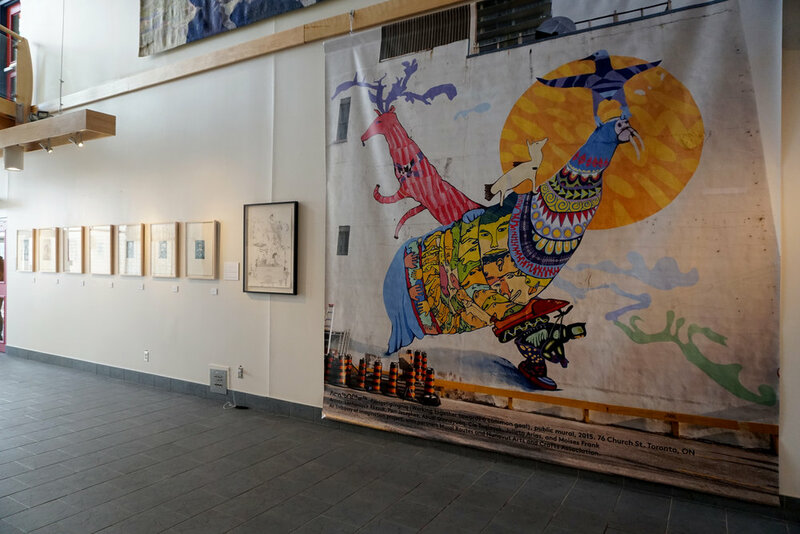 These prints along with others, were exhibited at Square One in Mississauga in 2017 and the Theatre Centre in Toronto. ᐅᓇ ᑎᑎᕋᐅᔭᒐᖅ ᐃᒻᒥᓂᒃ ᐃᔾᔪᐊᖅᓯᓯᒪᔪᖅ ᓴᓇᔭᐅᓚᐅᖅᑐᖅ ᐃᔨᕙᓪᓗᖅ ᓴᒪᔪᐊᓕᖕᒧᑦ 13−ᓂᒃ ᐊᕐᕌᒍᖃᖅᑎᓪᓗᒍ (ᓴᐅᒥᐊᓃᑦᑐᖅ), ᐊᒻᒪ ᐃᔨᕙᓪᓗᓐᖑᐊᖅ ᓴᓇᔭᐅᓚᐅᖅᓯᒪᓪᓗᓂ ᐃᓱᒪᐅᑉ ᓴᓇᐅᒐᖏᓐᓂᒃ ᓴᖅᑭᑦᑎᖃᑕᐅᓚᐅᖅᑐᒧᑦ ᐊᓕᒃᓴ ᕼᐊᓇᑲᒧᑦ (ᑕᓕᖅᐱᐊᓃᑦᑐᖅ). 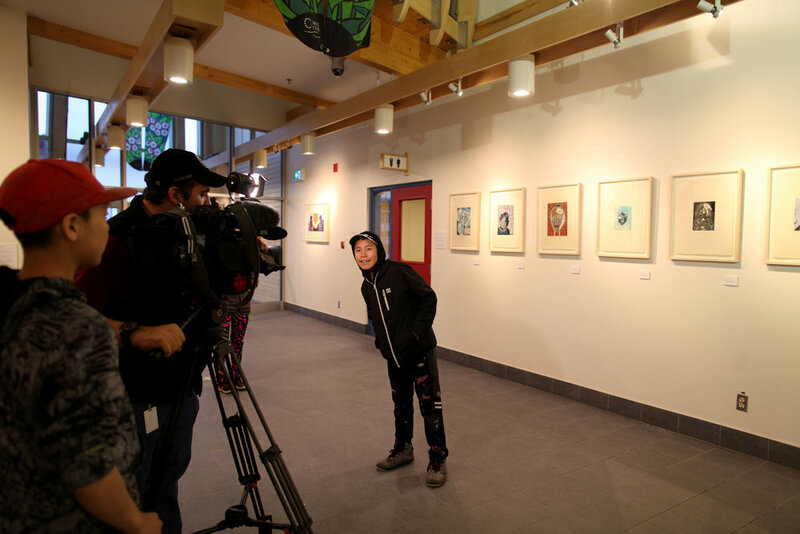 ᐅᓇ ᑎᑎᕋᐅᔭᖅᑕᖅ ᓇᑎᒃᓴᔭᒥᒃ ᓴᓇᓯᒪᓪᓗᓂ, ᐊᒡᒐᒧᓪᓗ ᑎᑎᕋᐅᔭᖅᓯᒪᓪᓗᓂ. 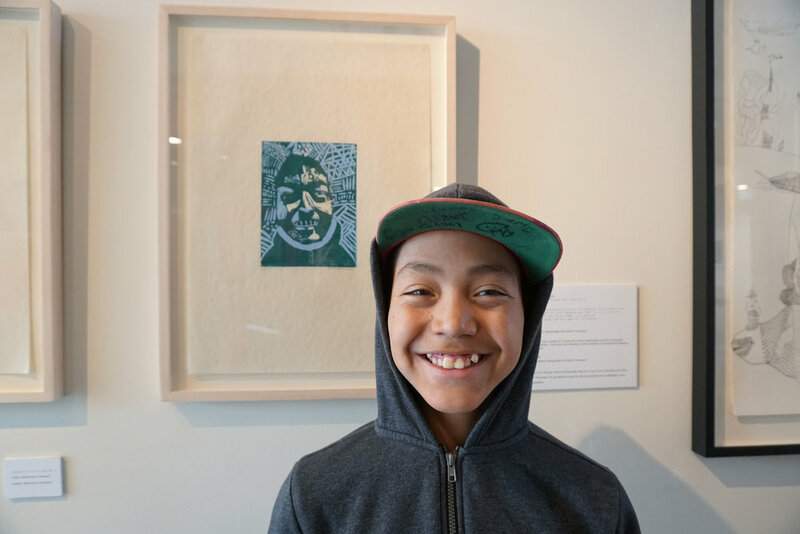 This print is a both a self-portrait of Ezeevalu Samayualie which he did at age 13 (left), and a portrait of Ezeevalu by EOI co-founder Alexa Hatanaka (right). 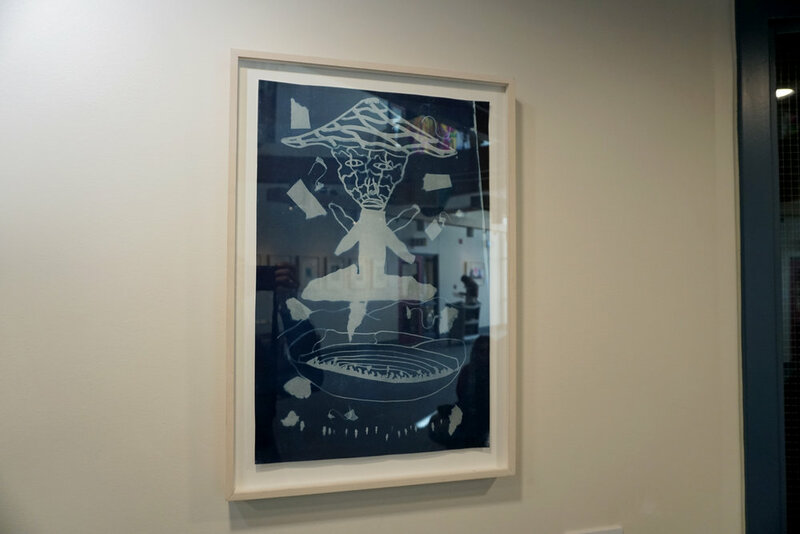 It is a reductive relief print using linoleum, printed by hand. ᐅᓇ ᑎᑎᕋᐅᔭᒐᖅ ᓴᓇᔭᐅᓚᐅᖅᓯᒪᔪᖅ 15-ᓂᒃ ᐊᕐᕌᒍᖃᖅᑐᒧᑦ ᔮᓂ ᓴᒪᔪᐊᓕᖕᒧᑦ ᐊᒻᒪ ᐃᓱᒪᐅᑉ ᓴᓇᐅᒐᖏᓐᓂᒃ ᓴᖅᑭᑦᑎᖃᑕᐅᓚᐅᖅᑐᒧᑦ ᐹᑐᓕᒃ ᑖᒻᓴᓐᒧᑦ. ᑖᔅᓱᒥᖓ ᑎᑎᕋᐅᔭᓚᐅᖅᑑᒃ ᓂᑭᑦᑖᖅᖢᑎᒃ, ᐅᖃᐅᓯᕐᓂᒡᓗ ᐊᑐᕐᓇᑎᒃ ᑎᑎᕋᐅᔭᖅᐸᓪᓕᐊᓚᐅᖅᖢᑎᒃ ᐅᐸᓗᖓᐃᔭᖅᓯᒪᓐᖏᑦᑎᐊᖅᖢᑎᒃ. 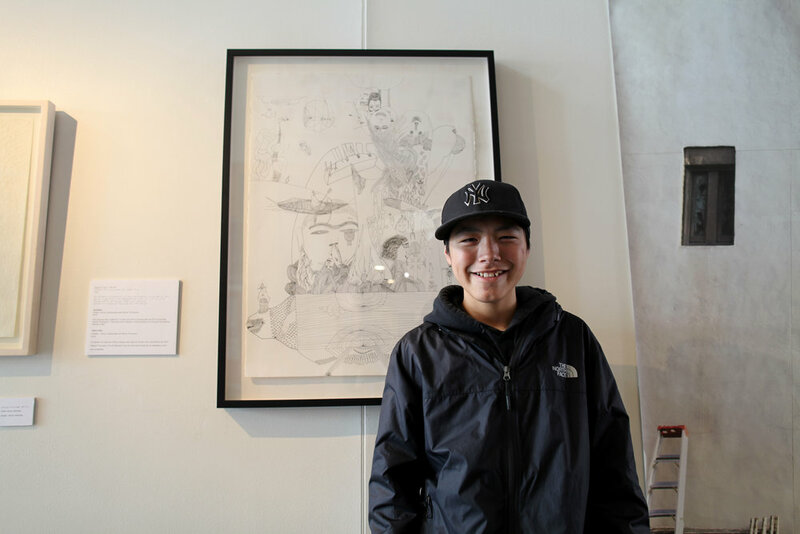 This drawing was created by 15 year-old Johnny Samayualie and EOI co-founder Patrick Thompson. They took turns drawing, communicating only through the drawing, without a plan. ᒪᒃᑯᒃᑐᑦ ᐊᕐᕌᒍᓖᑦ 13 ᐊᒻᒪ 15 ᐊᑯᓐᓂᖏᓐᓂ ᓇᒡᕚᖅᑕᕕᓂᕐᓂᒃ ᐊᑐᖅᖢᑎᒃ ᑎᑎᕋᐅᔭᓚᐅᖅᑐᑦ ᐅᑯᓂᖓ, ᐊᒻᒪ ᐸᐃᑉᐹᓂᒃ ᑭᔾᔭᖅᑐᖅᓯᒪᔪᓂᒃ ᓴᓇᓚᐅᕆᓪᓗᑎᒃ ᓯᕿᓂᕐᒥᒃ ᐊᑐᖅᖢᑎᒃ, ᓴᓇᔭᖏᑦ ᖃᓄᐃᑦᑐᑐᐃᓐᓇᐃᑦ ᓂᕐᔪᑎᓐᖑᐊᑦ ᐊᒻᒪ ᓄᓇᓐᖑᐊᑦ, ᐃᓄᖕᓄᓪᓗ ᓴᓇᕐᕈᑎᑐᖃᕕᓂᓐᖑᐊᑦ. 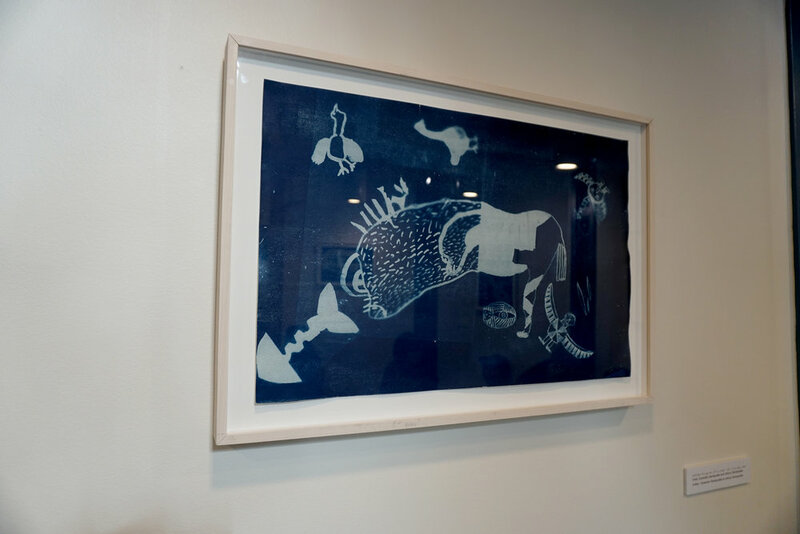 The youth aged 13-15 used collage with found materials, drawing and paper-cutting to create these cyanotype prints (prints created using the sun) featuring imagined creatures and scenes, and traditional tools. 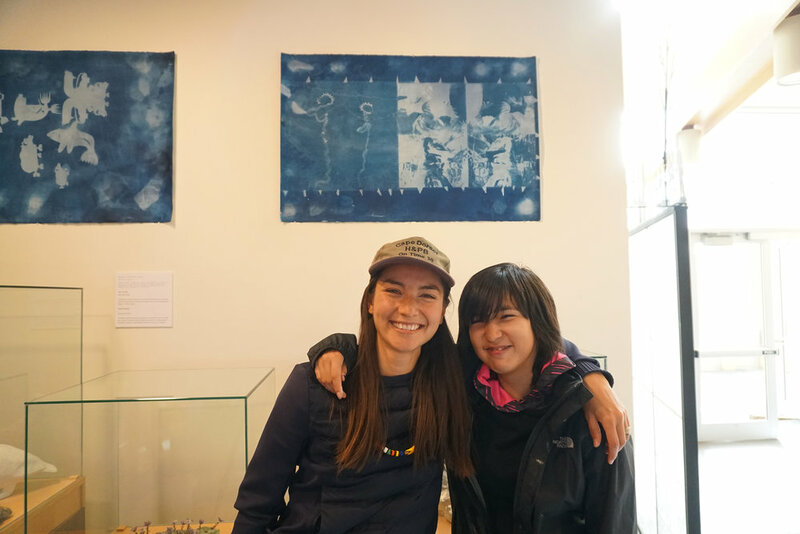 ᐅᑯᐊ ᐸᐃᑉᐹᓂᒃ ᑭᔾᔭᖅᑐᖅᓯᒪᔪᓂᒃ ᓴᓇᓯᒪᔪᑦ ᓴᓇᔭᐅᓚᐅᖅᑐᑦ 13−ᓂᒃ ᐊᕐᕌᒍᓕᖕᒧᑦ ᑕᐃᕕᑎ ᐸᓪᓗᕐᒧᑦ. 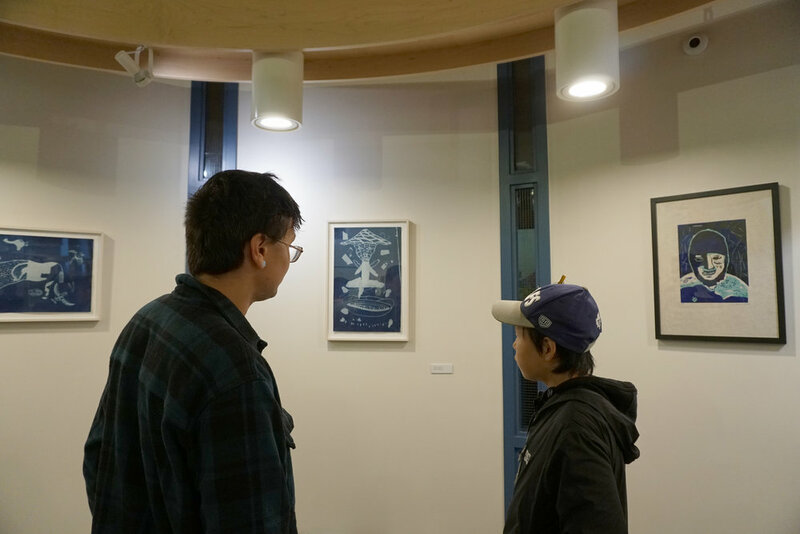 ᓴᓇᓚᐅᖅᓯᒪᔭᖏᑦ ᑎᑎᕋᐅᔭᒐᕐᓂᒃ ᐊᑐᖅᖢᑎᒃ ᐊᐅᓚᔫᓕᐊᒃᓴᓄᑦ ᐃᓚᒋᔭᐅᖃᑕᐅᔪᒃᓴᐅᑕᐅᓪᓗᓂ, ᐃᓚᒋᔭᐅᖃᑕᐅᓚᐅᕆᓪᓗᓂ ᐅᑭᐅᖅᑕᖅᑐᒥᓐᖔᖅᑐᑦ ᑎᑎᕋᐅᒐᔭᐃᑦ ᑕᑯᒃᓴᐅᑎᑕᐅᔪᒃᓴᓄᑦ ᓚᓐᑕᓐ ᐃᖕᓚᒥ. 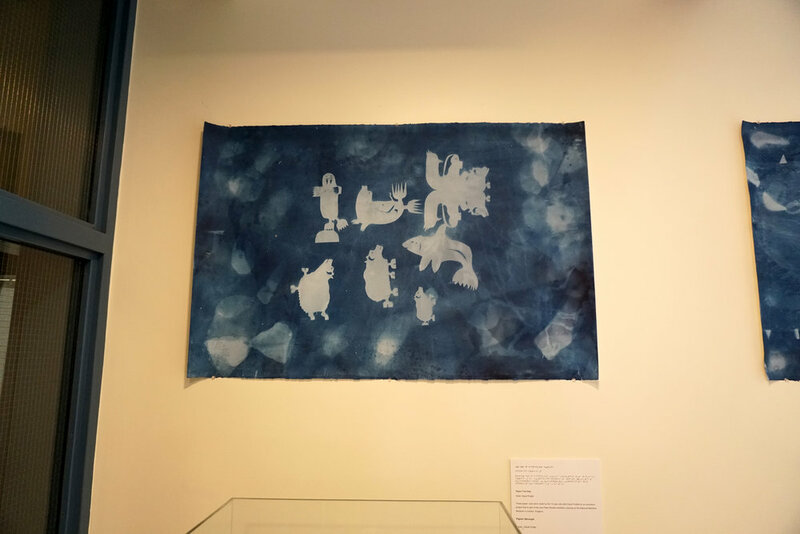 These paper- cuts were made by the 13-year old artist David Pudlat for an animation project that is part of the new Polar Worlds exhibition opening at the National Maritime Museum in London, England.